This replacement power window regulator w/o motor is just what you need to get your van in good shape again! 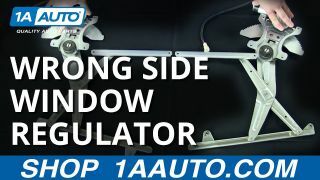 This window regulator makes a great replacement and has substantial cost savings over a dealer unit. Pry up the switch plate and disconnect the power window switch from the wiring harness. Remove the two 10 mm bolts in the door pull. 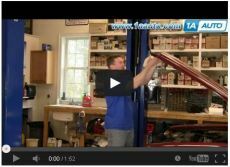 Unclip the door panel by working around the edges and pulling outward. Disconnect your window from the window regulator by pressing the tabs on the clips and unlatching them. Tape your window up out of the way. Use your pliers to release the balance spring and set it aside. Uncrimp the window regulator with your pliers and slide it out of the window track. Slide the new regulator into the window track. Insert the assembly into the door. Mount the tracks back into place in the door. Replace the balancing spring and lock bolt. Plug the power window switch in to test the regulator. Use your pliers to tighten the balancing spring back into place. Untape the window and slowly lower it back into the clips in the regulator. Thread the wiring through the panel. Clip the door panel back onto the door. Bolt the two 10 mm bolts back into the door panel. Connect the control switch panel and clip it back into the door pull.